The Help menu gives you access to a specific help page in the Online Help, the Instant Terra forum, the samples directory, and the About page. Tutorials...: Opens the Instant Terra tutorials playlist on the Wysilab YouTube channel. Getting started tutorial: Opens the Getting started video on the Wysilab YouTube channel. 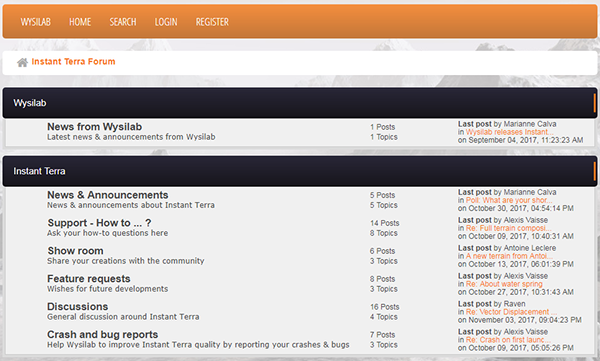 Main page: Opens the Welcome page of Instant Terra documentation. 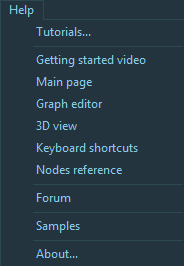 Graph editor: Opens the main Graph editor help page. 3D View: Opens the main 3D View help page. Keyboard shortcuts: Opens the keyboard shortcuts help page. Nodes reference: Opens the page listing the different categories of nodes. Select Help > Forum to open the Instant Terra forum. Select Help > Samples to opens your local folder where the samples have been installed. See Terrain examples for details. Select Help > About to open the About page. This window displays the information about your license. You can also buy, upgrade, or install you license on another computer from this window. See Buying a license, Upgrading a license and Using a license on another computer for more information.